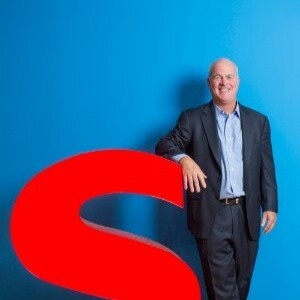 This guest post was contributed by Jeff Davis, Founder, The Sales + Marketing Alignment Summit. There has been a lot of talk lately about the news that CEB released some time ago that shows us that the typical B2B buyer is already 57% through the purchase process before reaching out to sales. Additionally, the average number of decision makers on a typical purchase has increased from 5.4 to 6.8 according to Brent Adamson, Principal Executive Advisor at CEB. Many sales professionals and leaders perceive that these changes in the buying process are making it increasingly difficult to consistently hit revenue targets in B2B. I, however, see this as an opportunity for forward-thinking sales leaders to better align with their marketing colleagues to dominate the space where prospects are spending the majority of their time. While many sales organizations are only focused on aggressively bombarding prospects during the last 43% of the buyer's journey (which has become extremely annoying and ineffective), there exists a significant opportunity to get in front of customers before they enter the "buying window." This period is critical because it is when most buyers start to figure out what they need, want, and desire regardless of actual product or solution. To make your product stick in the mind of the buyer, sales and marketing leaders need to approach them together during this period of the purchasing process before the buyer reaches out to sales. The goal of this outreach and content should be to generate higher-value conversations with prospects. This outreach should focus on helping decision makers clearly identify their business problem and develop a vision for how they will go about solving it. This conversation should not focus on product features and benefits, but on shaping the way the prospect sees their business issue and views potential solutions. RAIN Group released research that specifically addresses the myth that buyers don't want to hear from sellers early in the decision-making process. In fact, their study shows that 71% of buyers want to speak with sellers when they are exploring new ideas to improve business results. The problem that most buyers find is that the early stages of the buying process are extremely difficult, confusing and frustrating. This is because there is too much information — The Paradox of Choice. This overwhelming amount of information from sellers and other sources actually impedes the buyer in identifying which types of solutions they should pursue and ultimately makes the buying process much longer. But what if B2B companies could help buyers navigate all this information and give them clarity about how to accurately assess their business problem and evaluate potential solutions? This kind of useful information would be a game changer for the buyer and a winning strategy for the seller. What's the best way to achieve that at scale? Aligning with marketing. 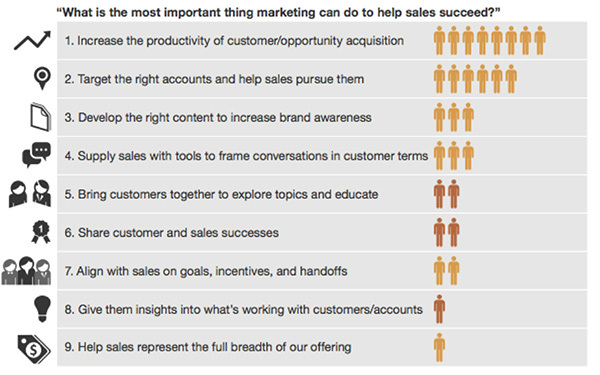 Sales leaders must understand, now more than ever, how Marketing can help Sales achieve revenue targets. With this knowledge, the sales team needs to make clear asks from Marketing that have a direct and measurable impact on revenue. No longer can sales leaders not understand the entire revenue funnel — all the way up to the top where historically only Marketing has operated. Sales leaders must look at the entire revenue funnel to ensure that their teams are being set up for success. Understanding the complete funnel is about more than just lead volume. It is about ensuring that collectively both teams are engaging customers at the right time, with the right content, and the right messaging to provide value and ultimately close more deals. Getting this sequence of outreach right is best done when Sales and Marketing are aligned and going to market together. If sales leaders are not yet convinced of the importance of understanding Marketing's contribution to the revenue pipeline, they can look at the significant difference in revenue attainment that aligned teams achieve. A recent study published by Aberdeen Group, Marketing/Sales Alignment 2016: Who is Agile Enough to Win?, shows us just that. 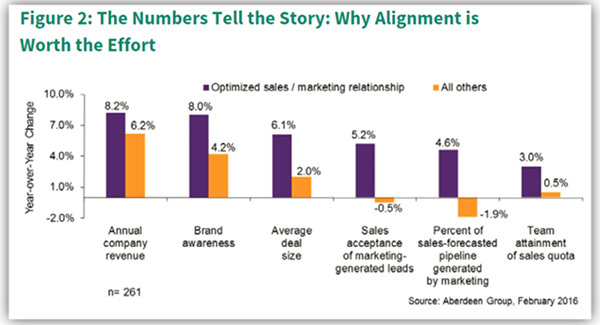 The study demonstrates the measurable difference in companies that "get" alignment and those that don't. The two metrics that are probably the most telling for sales leaders are (a) increase in average deal size and (b) team attainment of sales quota. What's even more incredible is that aligned teams saw over a three-fold increase in average deal size. This proves that alignment has a direct impact on revenue. For many sales leaders, having to understand how Marketing contributes directly to their team’s success may be a new concept. Thus, it’s important to empower sales leaders with the necessary information they need to evaluate if Marketing is providing them with the right things for their teams to win. Laura Ramos, principal analyst at Forrester, published a great paper, From Priming The Pipeline To Engaging Buyers: The B2B CMO’s New Role In Sales Enablement, that helps us understand the most important things that marketing leaders can do to help Sales be successful. When we get more granular and ask how Marketing specifically can help Sales be more successful some very interesting things emerge from the perspective of marketing colleagues. I think capturing this information is vital because it gives the sales leader some tangible things to ask for as the two leaders start to develop a more interdependent relationship. It also empowers the sales leader with a language that uniquely speaks to the marketing leader in the way that they see the business. The only precaution I would give sales leaders in looking at the top 5 responses below is No. 3. Although in marketing terms brand awareness can be an important factor depending on the size and maturity of the organization, as a sales leader I would focus on marketing producing content that helps Sales have higher-value conversations with customers and helps prime the customer to be more open to have a conversation about how and why their business needs to change. More and more, the biggest competitor for B2B sales professionals is the status quo, not another product or service. I think this feedback is a great place to start the conversation between the head of Sales and Marketing to ensure that the teams are moving toward alignment and can take advantage of the significant opportunity that lies within the first 57% of the buyer’s journey that many consider to be lost. To keep pace with the latest thinking in the sales profession, subscribe today to the LinkedIn Sales Blog.